A terrain_base material is a default material for terrain objects. Via this material you can manage different options for terrain optimization and control the post processing for terrains. Terrain has a quite different material system in comparison to usual Unigine materials. You should specify the most of terrain textures via the Nodes tab (see the Terrain Materials article for details). The terrain_base material has the following Options and Post processing states. Auxiliary - enables an auxiliary option and an ability to use auxiliary texture. Ambient occlusion - enables an ambient occlusion texture and parameters. Invert occlusion - inverts AO occlusion map influence on albedo. Subtract materials - subtracts invisible materials inside every layer and draw only visible ones - helps to increase performance on terrains with plenty of blended materials. May cause performance drop on terrains with small amount of materials. Subtract layers - subtracts invisible parts of layers and draw visible parts of their materials. May cause some graphical artifacts in sorting order of detail materials, but make a big performance boost. Material detail - enables detail terrain materials. Material roughness - enables terrain materials roughness calculation. Material normal - enables terrain materials normal calculation. SSAO - enables SSAO (screen-space ambient occlusion) post for terrain. SSR - enables SSR (screen-space reflections) post for terrain. SSS - enables SSS (sub-surface scattering) post for terrain. DOF - enables DOF (depth of field) for terrain. Motion blur - enables motion blur for terrain. Sun Shafts - enables sun shafts for terrain. Ambient occlusion (AO) texture modulates the global environment illumination. 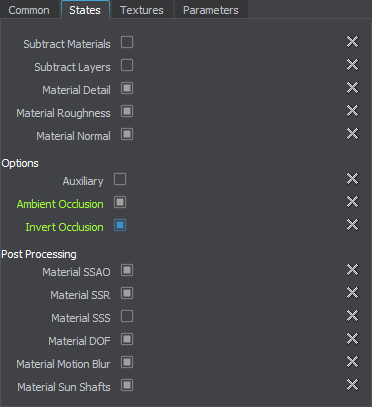 Ambient occlusion texture slot is available if a Ambient occlusion option is enabled. Auxiliary texture that used for auxiliary rendering pass. Auxiliary texture slot is available if a Auxiliary option is enabled. 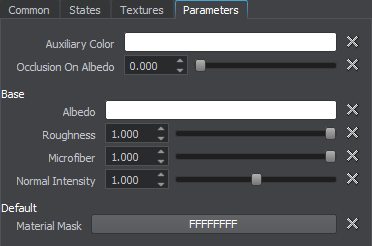 Material mask parameter specifies material bit-mask. Base parameters have influence on the all corresponding terrain textures. Albedo - a color multiplier for the albedo texture. Roughness - is a multiplier of the terrain roughness. Normal intensity - is an intensity of the relief of the normal map. Auxiliary - a color multiplier for the auxiliary texture. Occlusion on Albedo - occlusion influence on albedo texture.